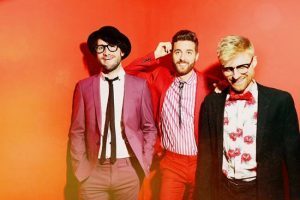 Jukebox the Ghost is an exciting and lively band both live and on-record, with their own fresh twist on piano-rock. 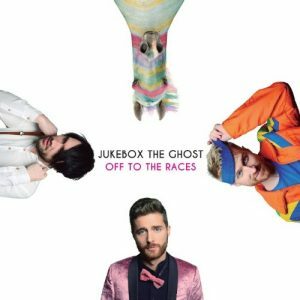 The band, which has been together for almost 10 years, released a new album, Off to The Races, on March 30. The band touts it as a giddy, vibrant, and colorful collection of songs. Jukebox the Ghost formed in 2006 while its members were in college. Made up of Ben Thornewill on piano/vocals, Tommy Siegel on guitar/bass/vocals, and Jesse Kristin on drums/vocals, the band has performed over 1,000 times across the world. Off to The Races shows that Jukebox the Ghost is willing to take bold music risks from the start of the album with the song “Jumpstarted.” The band says it’s “a mishmash of modern pop, retro vocals, and classic rock indulgence, which is what it’s like to be inside Thornewill’s brain.” The second track on the album, “Everybody’s Lonely,” has a party feel to its music video and has something in common with Queen’s “Bohemian Rhapsody” in its surprising musical shifts and changes. The subject is incredibly relatable, as loneliness can find everybody from time to time, to the point that it’s being covered like a cultural epidemic. The band’s most striking influence is, naturally, Queen, whom they pay tribute to yearly when they perform in Queen costumes. “Something magical about Queen to me is that their songs are so catchy, but the song structures are so wonderfully wrong and they’re so unafraid to showcase their chops,” says Siegel. “Their music is a reminder to me that pop music doesn’t have to come in a neat, restrained package. It’s OK to get weird and own it – and you can still be catchy,” Thornewill adds. Jukebox has toured as opening acts for artists such as Ingrid Michaelson and Ben Folds. They have also performed on The Late Show with David Letterman and on Conan, and have entertained the crowd at half-time during a New York Knicks game at Madison Square Garden. During their latest U.S. tour, the band will take to their largest venues to date in April and May. Come and see this high-flying piano-rock group at Saturn Birmingham this Saturday night at 9 p.m. Jukebox the Ghost will be joined by The Greeting Committee. Saturn is located at 200 41st St S, Birmingham, AL 35222. You can also catch a special acoustic set at Seasick Records Saturday at 1:30 p.m. Images and video courtesy of Stunt Company.